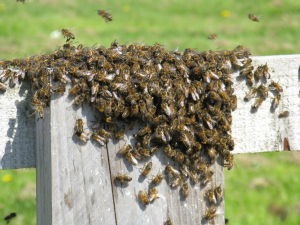 Observation - Honey Bee swarm - UK and Ireland. Description: Honey Bees swarming on the edge of Harborne/Selly Oak in Birmingham on 21/4/09. Honey Bees swarming on the edge of Harborne/Selly Oak in Birmingham on 21/4/09.